National Pet Memorial Day, which falls on the second Sunday of September each year, is one way to call attention to pet grief. This day was established for pet owners to honor pets past and present and to share the vital role that their animals have played in their lives. “When you lose a pet, you lose a part of yourself. You lose everyday rituals. There is an empty bowl on the floor, and an empty space in your home,” explains Hague, who specializes in grief counseling for individuals and families that have recently lost a pet. People may grieve the loss not only of dogs and cats but also horses, fish, turtles, hamsters, birds, and many other species with which they have developed a bond. It is not uncommon for owners to feel angry or depressed after a loss, which can affect their social and family relationships and their physical health. Hague says that grieving owners may even experience symptoms associated with trauma, including panic disorders, anxiety, sleeplessness, change in eating patterns, and an inability to concentrate that can interfere with work. Hague says that the best thing that friends and family can do is to be supportive, be compassionate, and to just be there for their loved one. Many people who are working through their grief take comfort in selecting a way to memorialize the pet. Sometimes this means burying the pet in the yard and planting a tree or shrub nearby. Pet cremation is another option; your veterinarian will be able to help arrange this service. 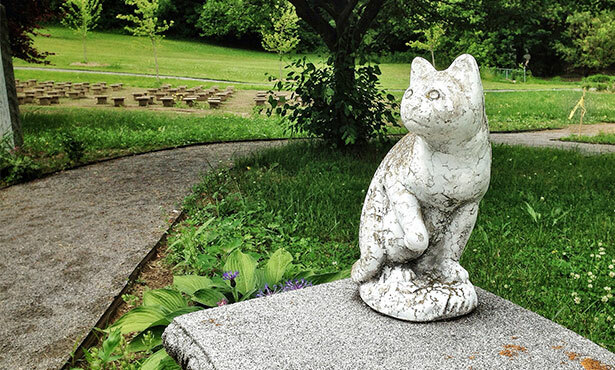 The pet’s ashes can be kept in a decorative urn or scattered in a meaningful location. Making a donation in the pet’s memory and displaying photos of the pet around the home are ways to show that the pet was an important and valued part of the family. Doing something that helps the community, such as volunteering in a shelter or collecting food for a food bank, is another great way to honor the pet. However, each person must decide when the time is right. “Whatever feels right to you is a good thing to do,” says Hague. Counseling is also helpful for many people as they move through their grief. Hague provides this service for clients of the Veterinary Teaching Hospital in person, over the phone, and via video chat. The American Counseling Association can also help locate a counselor in your area. If you have any questions about National Pet Memorial Day or grief counseling, contact a trained grief counselor or your local veterinarian.